A checklist is a list of items you need to verify, check or inspect. It can be used for a variety of purposes, safety checks, task checks, or maintenance checks for example. The Checklist categories grid shows all the available categories that are active (usable for any work order) and also if they are internal (used internally and not accessible to the customer). To start new checklist categories, right click on the grid and select ”New”. A window reading “Checklist Categories” will be shown. Fill in the Checklist Category field, then click Sort Order. This is used to organize the different checklist categories if you add more that one in a checklist. The sort will be done in increasing order, but if there are two or more with the same Sort Order, then alphabetical order will be applied. To add questions or items to be verified on the checklist, click on “Click here to add a new Checklist Template Question” or click the button with the ellipsis (…) to open a comment field. Your input is automatically saved. 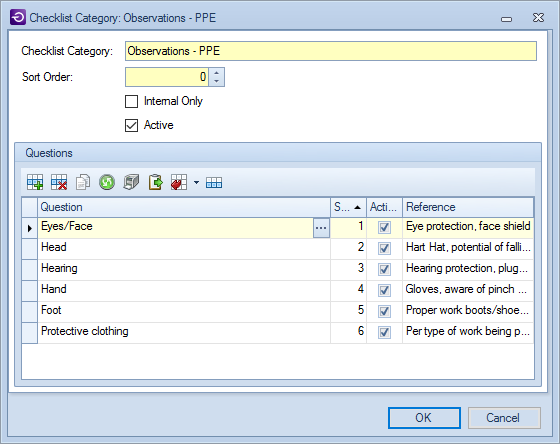 The “Reference” field can be used to list OSHA standards or documents. This will appear as a tool-tip when completing the checklist. If you need the checklist category “Active” and/or if it needs to be Internal Only, you can select the checkbox in this window.